How many hikes combine beautiful scenery, a unique historical multi-building site, and a mostly-level hike that is still long enough to occupy 3 or 4 hours? Interlaken Trail has all of that, and as a bonus it is not particularly crowded. A resort was established at this spot in the 1870s, but it really came into its peak under the ownership of James Dexter, who developed Interlaken into a luxury retreat for the wealthy in the 1880s. As progress brought more people and farms to the area, the Twin Lakes were enlarged with a new dam, and the only road leading to Interlaken was submerged. The resort closed and the buildings fell into disrepair. In the 1970s the dam was being raised again and the Interlaken site was facing inundation. In 1974 the site was placed on the National Register of Historic Places, and in 1979 the Bureau of Reclamation had the main buildings moved 150 feet and stabilized. The buildings, especially the Dexter cabin, are remarkably well-preserved given their history, but thousands of hours of volunteer time and many commercial sponsors have contributed greatly to their current condition. The trail to Interlaken begins at a trailhead not far from the Twin Lakes dam. It is actually a short section of the 150-mile Colorado Trail that stretches from Durango to Denver. Following the shore of the larger Twin Lake, the trail is very level for most of the route. The entire time there are great views of the lake, the aspen and spruce forests, and the looming presence of some of the tallest mountains in the state. Wildflowers are abundant. The historic site is very fun to explore, especially the Dexter cabin, which is open for exploration. From the lower level with its rare wood trim to the third level cupola with views all around, it is evocative and authentic. There are a number of informative displays and descriptions that make it a mini-museum in open air. 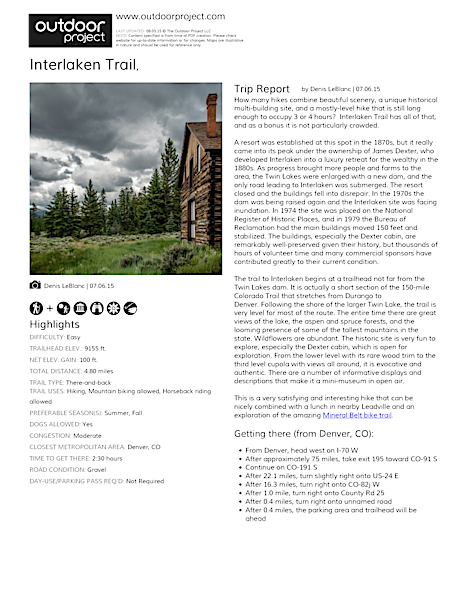 This is a very satisfying and interesting hike that can be nicely combined with a lunch in nearby Leadville and an exploration of the amazing Mineral Belt bike trail. Nearly level. Beautiful lakeside trail. Interesting historical site.